Catherine Frew, Auckland Libraries Head of Content and Access, is delighted to see Aucklanders' eBook borrowing grow and attributes this to Auckland Libraries’ innovative approach to their digital offering and making their eCollections easy to use. "We're proud to reach 4 million checkouts and this result reflects our focus on looking at fresh ways of reading, sharing knowledge and helping our users to make the most of our digital offering." "eBooks are great for people with busy lives and to take with you when you’re on the move. Nowadays we have electronic devices with us almost constantly and with Overdrive you can carry a whole free library with you"
Auckland Libraries has over 200,000 eBooks and eAudiobooks and 700 eMagazine titles in their digital collection, including the latest releases, classics, children’s and books in a range of languages. And now you can borrow more eBooks at once, with the maximum number of eBook issues per checkout increasing to 35. The digital collection can be accessed on your reading device from anywhere with WiFi connection, even if you’re out of the country - especially useful if you are going away these summer holidays. 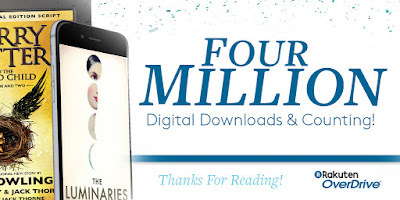 In addition to the 4 million borrows from the Overdrive collection, Auckland Libraries also offers eCollections from BorrowBox, Wheelers, EBSCOhost and RBDigital. Check out the Auckland Libraries' eCollections and set yourself up for your summer holiday reading!